The UN Security Council has unanimously agreed to lift sanctions against Eritrea after nine years. An arms embargo, asset freeze, and travel ban were imposed in 2009 amid claims Eritrea supported al-Shabab militants in Somalia. Eritrea always denied the accusations. The resolution, drafted by the UK, was backed by the US and its allies. BBC World Service Africa editor Mary Harper says the politically repressive state had long been a global pariah, and was likened by some commentators to North Korea. Eritrea agreed a peace deal with Ethiopia in June following two decades of animosity, while the leader of Eritrea and the UN-backed government in Somalia recently signed a joint cooperation agreement. However, the Council members now quote experts as saying there was no proof Eritrea backed al-Shabab. 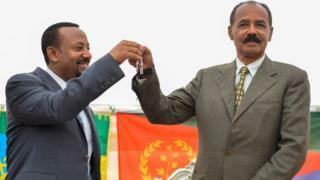 The bromance between Ethiopian's new reformist leader Abiy Ahmed and Eritrea's President Isaias Aferweki seems to have rubbed on neighbouring leaders. Eritrea, Ethiopia and Somalia have now signed a joint agreement of cooperation, and leaders of the three countries have met personally on three different occasions this year - something that hadn't happened in years.